I can't remember if I've shared the whole "bumblebee"/"wasp" costume thing on here before so if I have, please forgive me. We joined dance class in November. The first day we joined we were told that the costume orders had already been placed. All the girls were going to be "bumblebees" and the one boy in the class was to be a "wasp." At first the dance instructor mentioned having a "bumblebee" costume made for Eliza, she even asked about my sewing skills. I knew I wouldn't be able to make one, but I instantly thought of maybe asking my mom as she's pretty awesome at sewing. More time went by, I took Eliza to class and the instructor passed out all the costumes to take home. It was then and there when I realized that Eliza was most definitely NOT a "bumblebee." Her costume was very different from the others and it was hilarious!!! You guys, this entire get-up cracks us up! Eliza rocked this costume and didn't seem to mind at all that the other little dancers were sporting sweet little bumble wings, a cute leotard and a pretty skirt. Meanwhile Eliza and a little boy named, Jack, proudly pranced around the stage with crooked antennae and yellow and black striped bubble tops. When I was at the hospital and found out that I had just birthed a girl I imaged and dreamed about my daughter's first dance recital. I envisioned some sort of pastel and sequence tutu, hair in a bun and my daughter looking like a little ballerina. 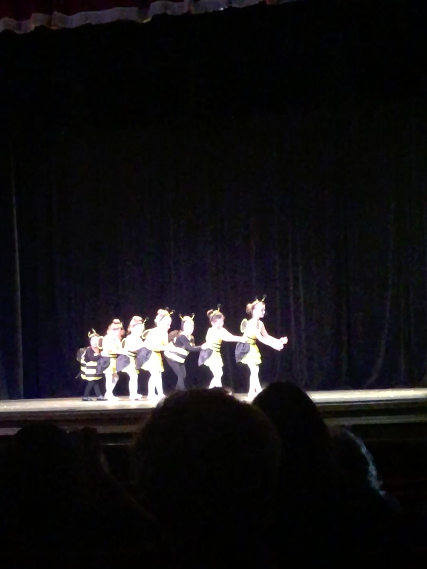 Never would I have imagined that our little baby girl would rock out as an awesome little "wasp!!!" I just love, love, love this story and I admire it even more knowing that she just rolled with it and she had a great time, to boot!!! Girlfriend had really wanted McDonald's for dinner and I'd promised that we'd go to dinner, but Jon and I had decided that we should probably go to a more comfortable setting with a group as large as we had, so Mexican it was. Eliza was NOT happy about it, but after a few tears and some promises of doughnuts for dessert all was right with the world. The only picture I have of both kids after the recital. I have NO idea what they're doing. Everyone came back to our house for a few minutes and both sets of grandparents gave Henry his birthday gifts. It sort of became an impromptu front yard birthday party for Henry! LOL! Everyone said their goodnights, hugs and kisses were exchanged and Eliza was congratulated on a job well done! We're so proud of Eliza and loved, loved watching her dance! We'll be signing up again, that's for sure...there's just too much cuteness to be had!